In converting improper fractions to mixed form you will just have to divide the fraction, find its quotient and its remainder. Remember that the fraction also means 34 divided by 5. The quotient 6 is the whole number on the mixed fraction. 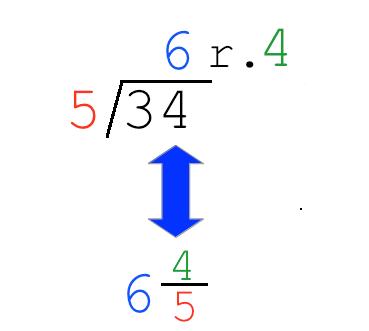 The divisor 5 is the denominator of the mixed fraction. The remainder 4 goes to the numerator of the mixed fraction.